We've heard whispers about what Apple has planned for its next major refresh of the iPad Pro range for the last year or so – without getting an indication of what the finished product might look like. Until now, that is. An alleged CAD model of the next iPad Pro model has surfaced online, which shows a number of the rumoured design changes coming to the high-end tablet range, including the move away from Lightning to USB-C.
CAD models are computer-generated representations of a product used by designers during the creation of a new product. These three-dimensional designs are often sent to third-parties to allow them to design cases and accessories. If the leaked CAD model screenshots are accurate, the next iPad Pro looks set to sport more rounded corners than its predecessor. The corners of the edge-to-edge display follows the curves of the hardware, similar to the iPhone X design. In order to achieve the all-screen design, the 2018 iPad Pro will drop the circular home button from previous models in favour of Face ID. However, unlike the iPhone XS and other Face ID-enabled iPhones, the iPad display will not have a notch. Despite the new iPad Pro models sporting thinner bezels, the borders around the display will still be wide enough to accommodate the TrueDepth camera system needed to recognise users' faces to unlock the tablet and authenticate payments. Earlier reports from the supply chain suggest Apple has managed to tweak its Face ID system to work in both portrait and landscape orientations – something not currently possible with the latest iPhone models. The leaked CAD model also appears to confirm one of the most controversial rumours about the new iPad Pro model – the switch to USB Type-C. It appears that six years after introducing the Lightning connector with the iPhone 5, Apple will purportedly ditch the universal iOS port in favour of USB-C.
Rumours of a move away from Lightning surfaced earlier this week courtesy of iOS software developer Guilherme Rambo, who unearthed a slew of references to the USB Type-C port inside the latest iOS 12.1 beta. According to the unreleased software, the USB-C port will be used to output 4K HDR video footage to external displays. That's a significant upgrade compared to previous versions of the tablet, which were only able to push 1080p HD video to external displays using the £49 ($49) Lightning Digital AV Adapter accessory. 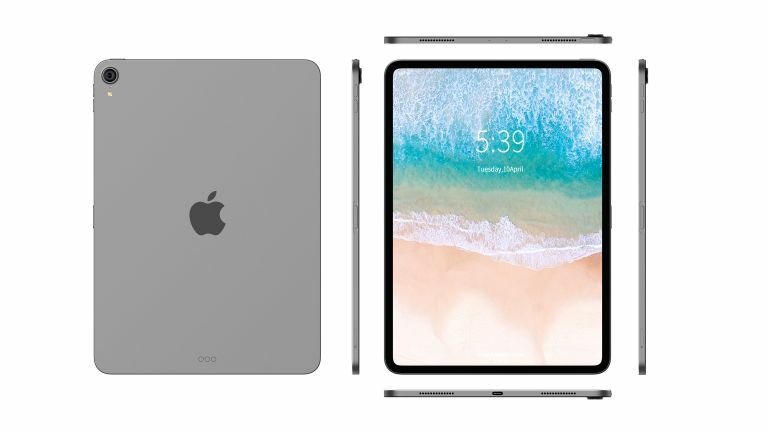 The leaked CAD model tallies with the references discovered in the beta code, with a USB-C port pictured on the underside of both the 10.5-inch and 12.9-inch iPad Pro models in place of the Lightning connector. Elsewhere, it looks like the dual-camera set-up found on the flagship iPhone models will not make the jump to the high-end iPad range. If the CAD models are accurate, it looks like there's still going to be a substantial camera bump on the back of the iPad, too. According to iOS developer Rambo, a new version of the Apple Pencil with AirPods-style proximity-based pairing will launch alongside the updated iPads. One of the references unearthed in the iOS 12.1 beta referred to an as-yet unannounced device labelled "iPad2018Fall device", which seems to suggest an official reveal from Apple can't be too far off. From time to time, Apple holds a hardware event in October to refresh its iPad and MacBook line before the holidays.